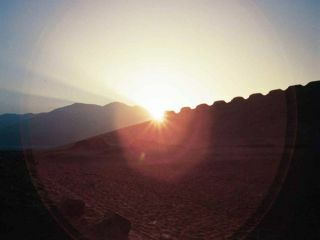 The rise of the sun between Tower 1 and Cerro Mucho Malo at the June solstice, 2003, viewed from the western solar observaotry. The sunrise position at the solstice has shifted to the right approximately 0.3° from year 300 BC. The oldest solar observatory in the Americas has been discovered in coastal Peru, archeologists announced today. The 2,300-year-old ceremonial complex featured the Towers of Chankillo, 13 towers running north to south along a low ridge and spread across 980 feet (300 meters) to form a toothed horizon that was used for solar observations. Researchers excavated the solar observatory between 2000 and 2003. They found buildings-in exact mirror position of each other-to the east and west of the towers with observation points for watching the Sun rise and set over the toothed horizon. In addition to the daily east to west motion, our Sun appears to move eastward through the stars in a path known as the ecliptic over the course of a year. Also, the Earth's axis is not perpendicular to the ecliptic but slanted by an angle of a little over 23 degrees. The combinations of these positions determine where the Sun is above our horizon day by day. At different times of the year one can observe the Sun rise and set in different spots with respect to our horizon and for different lengths of time. For example, in the Northern Hemisphere, around the summer solstice-which falls on June 21-the Sun rises highest in the sky and stays up longer. As viewed from the two observing points of Chankillo [image], the spread of towers along the horizon corresponds very closely to the range of movement of the rising and setting positions of the Sun over the year, the authors write in the March 2 issue of the journal Science. Once the Sun started to move away from any of its extreme positions, like the solstices or equinoxes, the towers and gaps between them provided a means to track the progress of the Sun up and down the horizon, to within a couple of days accuracy. "Chankillo is arguably the oldest solar calendar that can be identified as such with confidence within the Americas," said lead study author Ivan Ghezzi from Pontificia Universidad Catolica del Peru. Tree-ring samples dated these structures back to the fourth century B.C. "Many indigenous American sites have been found to contain one or a few putative solar orientations," Ghezzi said. "Chankillo, in contrast, provides a complete set of horizon markers and two unique and indisputable observation points." At the end of a 131-foot-long corridor in the building to the west of the towers, the researchers found pottery, shells, and stone artifacts in an area possibly for commoners who participated in rituals linked to solar observations. Previous studies showed that the Incas-South American Indians who established an empire that once ranged from northern Ecuador to central Chile from 1100 to the 1530s-had built sites to mark solar observations by 1500. In comparison, the earliest portion of Stonehenge-megalithic ruins in southern England purported to correlate with the rising and setting of the Sun and the Moon-is said to have been completed around 3000 B.C. The new finding, however, puts Sun cults in the Americas at an earlier date than the Incans. "Chankillo was built approximately 1,700 years before the Incas began their expansion," Ghezzi said. "Now we know these practices are quite a bit older and were highly developed by Chankillo's time."